PORT WASHINGTON, NY (November 06, 2014)—Lillian McCormick didn’t realize who Glenn Bradford was when she waltzed into his shop with her winning grand raffle prize, a $1000 Gift Certificate that she received while attending Landmark on Main’s Annual Gala Event. Glenn did not realize who she was either. 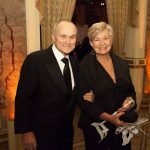 Lillian and Glenn became fast friends, as they shared their love of philanthropy and giving back. As a matter of fact Lillian was the founder of The Landmark on Main Street and has been recognized for her life’s work as a community leader and activist advocating on behalf of women, children, the elderly and others. Lillian enjoyed perusing through what felt like a life size jewelry box, while Glenn shared the inspiration behind many of his collections. 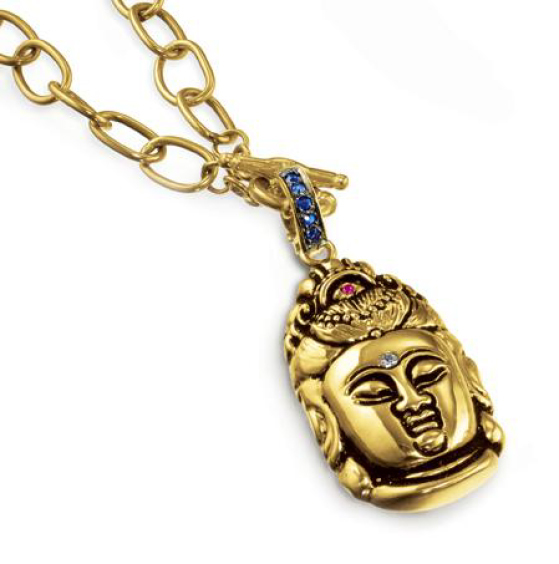 Being a spiritual sort and a collector of Buddhas from around the world, Lillian ultimately chose a Buddha Pendant from Glenn’s award-winning collection. A few weeks later, Lillian attended a fund-raiser for the Women’s Fund of Long Island (WFLI), proudly wearing the Buddha around her neck. Standing next to her was my friend, Wini Freund, former president of the Fund’s Board, who exclaimed ‘Lillian, you gave his daughter, Tayler, the Shapiro-McCormick Young Woman Leader Award last year at the Fund’s Annual Breakfast!’ I had not realized that Tayler Bradford was Glenn’s daughter. I could not wait to tell Glenn of the coincidence of my having given an award to his daughter a year earlier and having won his generous gift certificate from one of the charities that I had founded. Glenn and Sharyn Bradford strongly believe in the act of giving back. 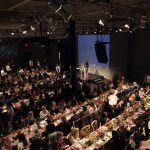 Their years of grassroots philanthropy have raised awareness and substantial funds for both local and global charities. Their 13th annual “Glenn Bradford Shop for Charity” runs from November 15th-Christmas. 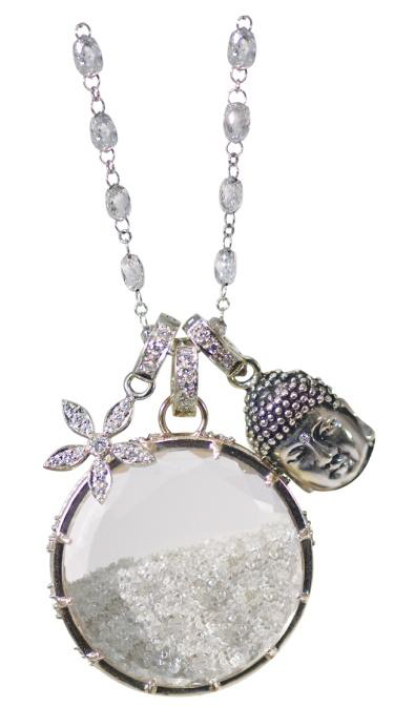 The Bradford’s are donating 10% of sales from their spiritual collections that include their award-winning “Buddha”, “Love Locket” and “Diamond Dust”, and 5% of all else to their customers’ charity of choice from this year’s registered list. 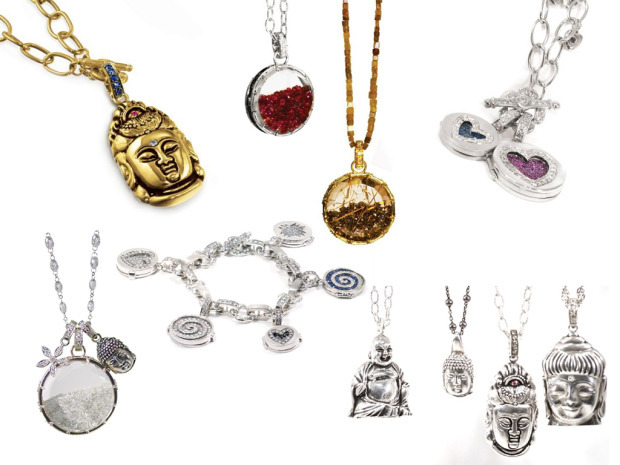 Clients seeking a deeper connection to their personal history often pack up their jewelry boxes to visit with “the spiritual jewelry guru”, Glenn Bradford, who has cultivated a reputation and following for reimagining tired family jewels. Glenn’s artist wife, partner and collaborator, Sharyn, designed their award-winning eclectic space. Her over-sized, color-rich canvases adorn the walls of the shop, giving it a relaxed, creative vibe. 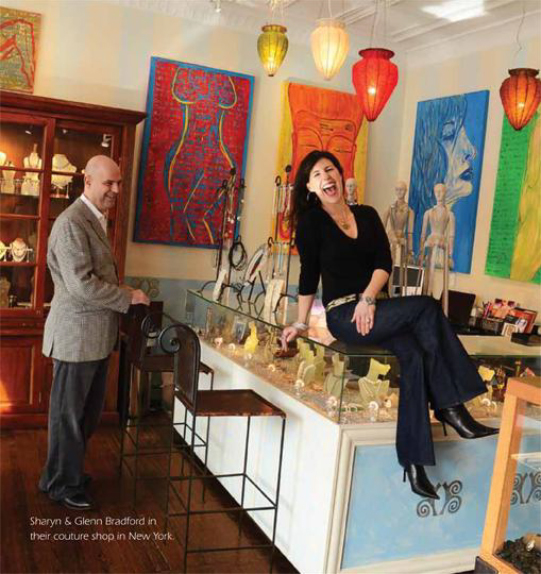 Glenn Bradford Fine Jewelry was recently selected as “One of the Coolest Jewelry Stores in America”, and has been touted by the press as a blend of Soho and the Hamptons. It is a full service jewelry shop, offering everything from watch batteries and repairs, pearl restringing, jewelry repairs and restoration, to small gifts and appraisals. The Bradford’s passion for giving back runs through their entire life. They have worked tirelessly to instill this same passion in their three children, who are now following suit as they are each emerging as young community service leaders. Tayler Bradford, now a senior at North Shore High School (NSHS), advocates for women and girls across Long Island through her programs for underprivileged girls at the North Shore Holiday House. 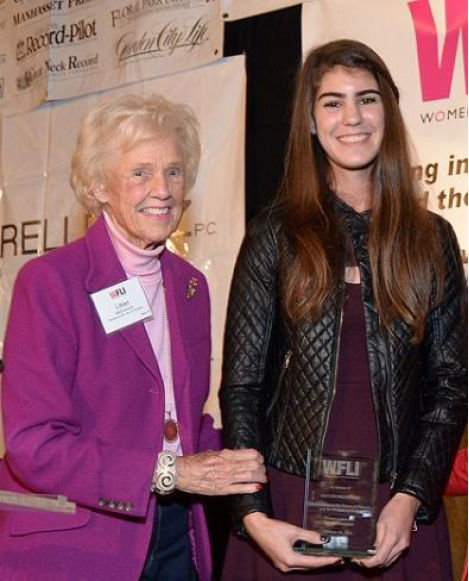 She received The Shapiro-McCormick Young Woman Leader Award along with a $2000 grant from the United Way to further her programs. Tayler was recognized for her academics, leadership and community service. 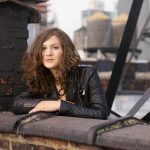 She is currently working on a photojournalism project that will depict the diverse and segregated faces of women and girls across Long Island, culminating in a gallery exhibition in the spring of 2015. All proceeds will be donated to WFLI. She is also a motivational speaker speaking at local schools and clubs, inspiring kids to become young leaders and community service advocates. 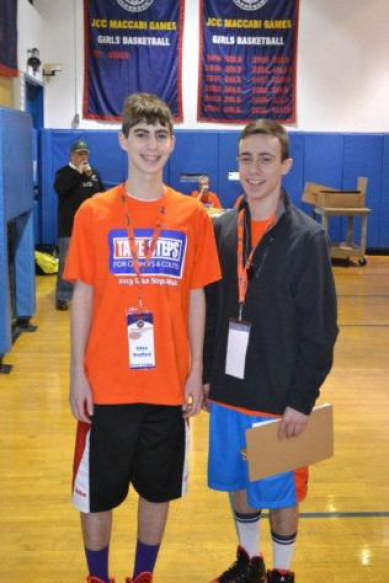 Ethan Bradford, a sophomore at NSHS co-founded “Hoops for Harrison” with his cousin Jagger Gillman to help find a cure for Crohn’s Disease. Jagger’s younger brother and Ethan’s cousin, Harrison, has been suffering from Crohn’s Disease since the age of seven. “Hoops for Harrison” is an annual charity basketball fundraiser where 100% of the proceeds are donated to the Crohn’s and Colitis Foundation of America (CCFA). The event is sponsored by and held at the Sid Jacobson JCC in Roslyn. Their 2nd Annual Charity Basketball Clinic for children ages 8-14 will be held at the JCC on Sunday, January 18th, from 1:30-3:30. For more information or to register please visit: online.ccfa.org/hoopsforharrison or contact CCFA at 516-222-5530. In addition, Ethan volunteers his time at the Glen Cove Boys and Girls Club both tutoring and coaching basketball and other sports. The Bradford’s youngest child, Hannah, a seventh grade student at North Shore Middle School (NSMS) has been working alongside her cousin Harrison, who is also a seventh grader at NHMS, to raise awareness and funds for CCFA, through the highly successful “Coins for Crohn’s” Fundraiser (founded by the Gillman family) that collects coins throughout the community, along with bake sales and the CCFA annual walk. 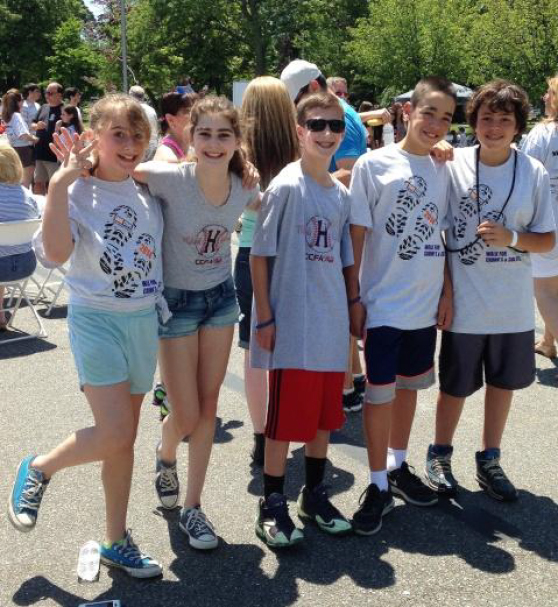 For the past several years, “Team H-Man” (Team Harrison) has been recognized as one of Long Island’s most successful fundraising teams. 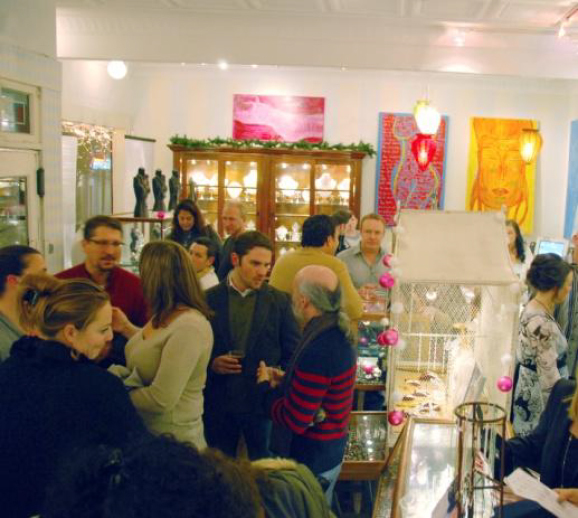 This Holiday Season, Glenn Bradford Fine Jewelry is partnering with The Women’s Fund of Long Island, Crohn’s & Colitis Foundation, The Long Island Alzheimer’s Foundation, Tuesday’s Children, Long Island Council on Alcoholism and Drug Dependency, Nassau County Museum of Art, Friends of The Sands Point Preserve, The Community Chest, Landmark on Main Street, The Port Washington Children’s Center, Port Washington Parks Conservancy, Residents for a More Beautiful Port Washington, The Port Washington Education Foundation, Friends of the Port Washington Library, The Nicholas Center for Autism and its sister charity The Spectrum Designs Foundation, along with other grassroots local charities that keep our communities vibrant. Registration is still open. Please visit glennbradford.com for a complete list of charities. Port Washington’s quaint & bustling Lower Main Street, where the Bradford’s shop has been located since 2004, has and continues to be an enclave of philanthropy. Their neighbors include Wit and Whim, the little shop with a big heart, that donates 100% of its profits, Ayhan’s Restaurants and Marketplace whose owner Ayhan Hassan is a long time advocate and community leader, and Nancy Sinoway, community organizer and owner of her namesake Tailoring & Denim Hospital, who founded the annual “Halloween on Main” when Halloween was cancelled due to Hurricane Sandy. “It’s very exciting to be right across the street from Glenn Bradford Fine Jewelry! His long-standing reputation has made him a staple in our community. Our businesses complement each other and offer a philanthropic shopping hub for people who want to, ‘gift and give back’ this holiday season,” states Laurie Scheinman, creator of Wit and Whim. So if you live in Port, you need not leave your tiny hamlet for the best and most engaging shopping experience of your life and for those out-of-towners it is a destination worth traveling to. The Bradfords hope to have their best “Shop for Charity” Season yet. So come out, shop local and enjoy the most delectable shopping experience. Support you charity and walk out with an award-winning Glenn Bradford design. 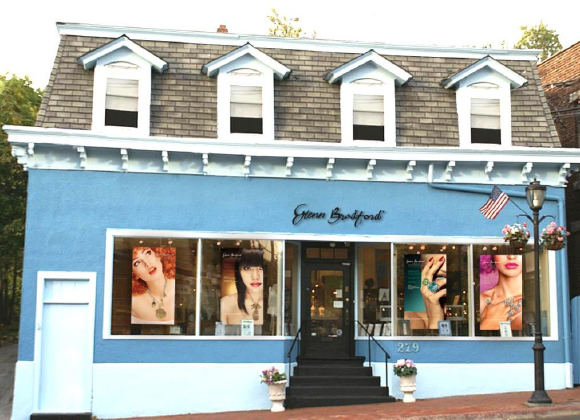 Glenn Bradford Fine Jewelry is located at 279 Main Street, Port Washington in their free-standing Queen Anne. If you can’t make it to the shop, you can “Shop for Charity” online at glennbradford.com. Registered charities to date include: The Women’s Fund of Long Island (WFLI) is a not-for-profit organization that has been working in local communities across Long Island for over twenty years to improve the lives of vulnerable women, girls and families by connecting them with financial resources, support and advocacy services to live healthy, productive lives. WFLI remains deeply committed to assisting grassroots organizations that are on the front lines, and will work with its extensive group of grantee partners and other groups entrenched in these communities providing assistance to those in greatest need. Crohn’s & Colitis Foundation of America (CCFA) is a not-for-profit organization whose mission is to cure Crohn’s disease and ulcerative colitis and to improve the quality of life of children and adults afflicted by these diseases. CCFA sponsors basic and clinical research of the highest quality. It also offers a wide range of educational programs for patients and health professionals, while providing supportive services to help people cope with these chronic and painful diseases of the digestive system. As of yet, Crohn’s disease is incurable, and patients experience periods of flares and remissions their entire lives. Tuesday’s Children is a not-for-profit that was founded to promote long-term healing in all those directly impacted by the events of September 11, 2001. Its mission today is to keep the promise to those children and families while serving and supporting communities affected by acts of terror worldwide. Today, Tuesday’s Children continues to provide direct services and continuous outreach to approximately 10,000 individuals. It has created an unprecedented level of trust with families, which experts view as a prerequisite to delivery of effective long-term services. Its roster of programs is continually evolving to meet the changing needs of the families it serves. The Long Island Alzheimer’s Foundation (LIAF) is a not-for-profit organization whose mission is to help improve the quality of life for individuals living with Alzheimer’s Disease and related memory disorders, and their caregivers. For 25 years, LIAF has been providing supportive community-based services to Alzheimer’s families on Long Island. LIAF takes considerable pride in its pioneering role in the development of cutting edge services that foster the independence, dignity, well-being and safety of individuals with Alzheimer’s, thus aiding in the prevention of premature nursing home placement. LIAF’s programs offer help and hope for families grappling with Alzheimer’s disease. Long Island Council on Alcoholism and Drug Dependency is a not-for-profit institution whose mission is to address the addictive climate of our times by providing initial attention and referral services to individuals, families, and children, through intervention, education and professional guidance to overcome the ravages of alcohol and other drug-related problems. Nassau County Museum of Art is a not-for-profit institution whose mission fosters a deeper understanding of art and culture through exhibitions and education programs for all ages and backgrounds. The Museum is a vital cultural resource welcoming over 200,000 visitors a year, presenting public programs such as family activities, artist talks, docent tours, film screenings and other special events that bring enrichment to the entire community. The Museum additionally offers varied programs for those with special needs including classes for children with autism and tours and discussions for adults with memory loss. Friends of The Sands Point Preserve is a not-for-profit organization whose mission is to preserve and protect the magnificent structures and grounds of the Sands Point Preserve, to promote the Guggenheim Estate as a living museum focused on the Preserve’s rich history, natural habitats, and the architectural features that enhance educational and cultural experiences for all who visit. The Community Chest of Port Washington is a not-for-profit organization whose mission is to raise funds for distribution to local charities dedicated to improving people’s lives. Community Chest funds support these charities’ programs in Port Washington, including services for children, seniors, families, and everyone in the community, exemplifying the spirit of The People of Port Helping the People of Port. Landmark on Main Street is a not-for-profit community center that enhances the spirit and enriches the lives of the communities of Port Washington and surrounding regions. Its core values build the foundation for all it does: Engagement, Community, Enrichment, Excellence, Welcoming. The Landmark welcomes you to our Community… Engaging with you and Enriching your life by sharing Excellence in the arts! The Port Washington Education Foundation is a not-for-profit whose mission is to support initiatives that are beyond basic educational needs and to enhance and expand educational opportunities for all students in the Port Washington public school district. The Port Washington Children’s Center is a not-for-profit, non-sectarian childcare center. The center is licensed by New York State Office of Children and Family Services. It is open year round. Port Washington Parks Conservancy is a not-for-profit organization whose mission is to Restore, Enhance, and Preserve the parks in Port Washington. 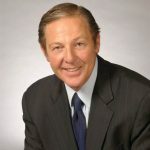 Mike Blumenfeld, a retired chairman and co-founder of Residents for a More Beautiful Port Washington, as well as an experienced longtime advocate for park formation and restoration adopted Stannard’s Brook Park and its restoration as his personal mission. With a vision and deep commitment he turned to two friends, Eric Pick, a co-founder and (then) the executive vice president of Residents for a More Beautiful Port Washington, and Jennifer Wilson-Pines, (then), the president of the North Shore Audubon Society and recipient of Environmental Protection Agency’s Excellence Award, and enlisted their help. Together, they formed, the “Friends of Stannard’s Brook Park Preserve” … and the seed of the Port Washington Parks Conservancy was born. Residents for a More Beautiful Port Washington (Residents) is a not-for-profit that has been committed to creating a strong, unified and sustainable community in Port Washington and the surrounding areas. It sponsors programs and related initiatives in the areas of Quality of Life, Environmental Education, Environmental Health, Policy and Planning. All of its programs have the same aim: To help protect the environment, enhance quality of life and increase environmental awareness on the entire Port Washington/Manhasset/Roslyn Peninsula. Friends of the Port Washington Library (FOL) is dedicated to strengthening the ties between our library and community, and to advancing the library’s mission as a center for life-long learning, information and culture. The Friends supports the library through volunteerism, programming, fundraising, outreach and advocacy. Founded in 1966, the FOL is an independent, nonprofit organization. Annual support from the Friends is counted upon to supplement each department’s programming budget. The Nicholas Center for Autism a not-for-profit is dedicated to developing innovative programs that assist individuals with autism to lead fuller, productive and meaningful lives. The Spectrum Designs Foundation is providing gainful and meaningful work opportunities to individuals with autism within a social enterprise; in an effort to assist them in leading fuller, independent and productive lives. The “Buddha Collection” has won two World Gold Council Design Competitions. 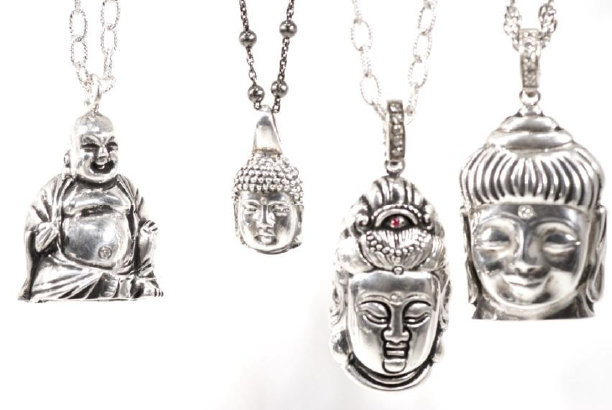 The Buddha Collection ranges from $195-8500. 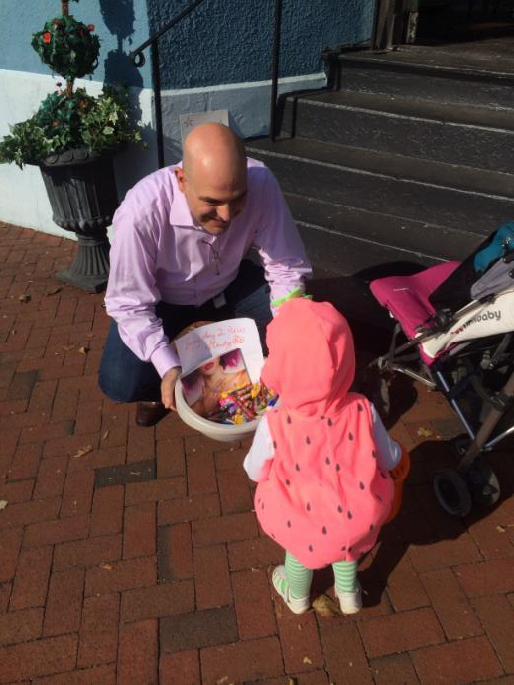 Glenn is sprinkled with magical ‘fairy dust’ by his family to bring goodness into his daily experience. His youngest daughter Hannah, at age seven, insisted that she was sprinkling him with ”Diamond Dust” and suggested that her Dad create a “Diamond Dust” Jewelry Collection so his clients could wear the same goodness on them, that she gives to him daily. The “Diamond Dust Collection “ has won both a World Gold Council Design Competition and the JCK Jewelers’ Choice Awards, voted by jewelers across the US for best jewelry design. 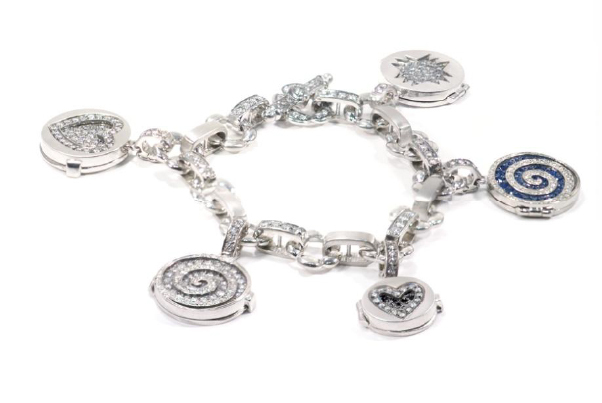 The Diamond Dust Collection ranges from $495-15000. 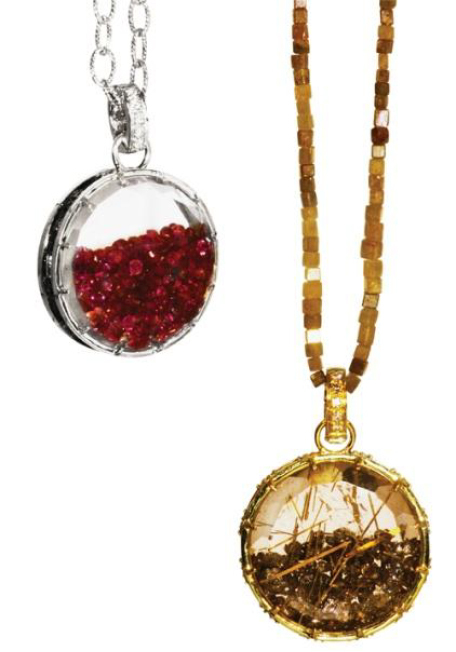 Left: Anti-tarnish Sterling Silver “Diamond Dust” with faceted rubies on silver Millgrain chain. Right: Award-winning 18kt Green Gold “Diamond Dust” with rough brown diamonds & Rutilated Quartz Crystals on Yellow Diamond Cube Necklace. Prior to his daughter Tayler’s first birthday, she would point to Glenn’s bracelet and then to her own wrist. When Ethan was born, Glenn crated his first locket for Sharyn as a push present. The “Locket Collection” has won multiple World Gold Council Design Competitions, the premiere Swarovski Colored Gemstone Design Competition and most recently the 2013 Palladium Alliance International Design Competition. 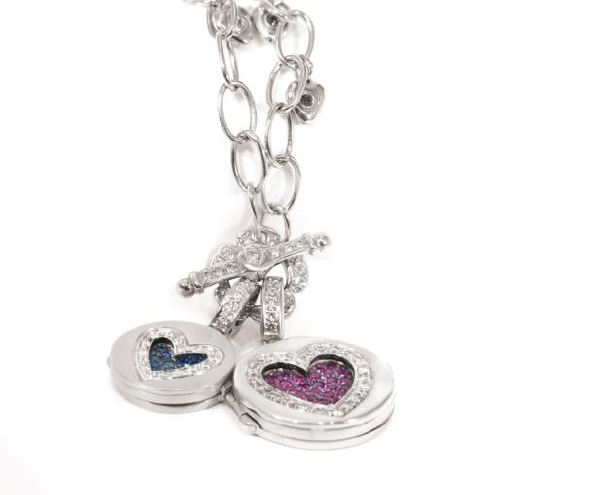 The “Locket Collection” ranges from $2250-16500.